The first training day of the European “Life-Innoprowire” Project will take place on Thursday November 26th. 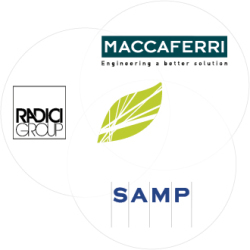 The project’s partners are Gruppo Industriale Maccaferri (namely Officine Maccaferri and Samp spa) and the Radici Group. The event will take place at Bentivoglio (Bologna) in the HeadQuarter facility of Samp spa (via Saliceto 15) where the partners will welcome professors and students of the Bologna University. Life-Innoprowire wants to contributes to the sustainable innovation process. This is fully “made in Italy” pilot project and it has been funded by the ECC for the LIFE+ program, the European backing tool focused on environment protection. Life-Innoprowire aims to design an innovative process, having minor environment impact, to produce steel extruded wires for the realization of protective and restraint structures realized with metallic mesh. The innovative side of the project, with a sustainable goal, consists of the use of polyamide based polymers, as a viable alternative to PVC, as coating. Established in 1879, Officine Maccaferri is a leading provider of innovative and environmental solutions to the construction industry. Renowned as the world leader in gabion retaining structures, Maccaferri has diversified significantly over the past 20 years and now offers engineered solutions from reinforced soil structures to coastal protection and from natural hazard mitigation to hydraulic works. Maccaferri researches, designs, supplies and provides construction solutions within its target markets. With business operations in 100 countries and a worldwide manufacturing footprint, Maccaferri has a global presence with local focus. Based in Bologna, Italy, Officine Maccaferri is at the heart of the Maccaferri Industrial Group. With productions plants and commercial offices in Europe, the United States, Latin America, and Asia, Radici Group is now one of the largest Italian chemical companies operating internationally. The Group’s industrial businesses are structured at a global level and are diversified within market sectors including chemicals, plastics, synthetic fibres and non-wovens. RadiciGroup is a solid, reliable and flexible company that offers quality and sustainable innovation to its customers. RadiciGroup products, from nylon polymers to technopolymers and from synthetic fibres to non-wovens, are applied in multiple sectors, including clothing, furnishings, automotive, consumer goods, construction, electric/electronics, electrical appliances, and sports.